A friend’s wedding is a very exciting time. It’s your duty, as the friend of the bride or the groom, to have the maximum fun at every function. It’s also your duty to look your best and get the nicest pictures taken with the couple. With a busy schedule, it seems nearly impossible to wander from market to market, shop to shop trying to look for the best wedding outfits. Instead of wasting time like this, head to Study By Janak for the best wedding collection for men and women. 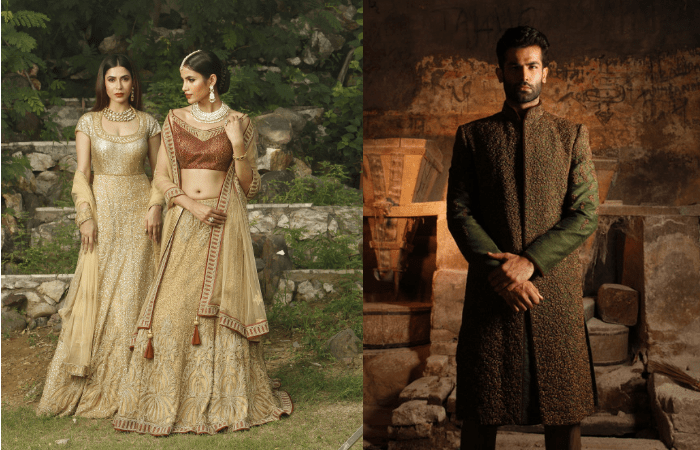 From dapper sherwanis and bandhgalas to gorgeous lehengas and gowns, you’ll find everything you need for your friend’s wedding right here. Have a look and pick out the best wedding outfits to dazzle at the wedding. With unique silhouettes for women and dapper designs for men, Study By Janak’s western collection has something for everyone. The suits and tuxedos for men are distinguishable in a crowd. The trendsetting gowns for women will make sure that you’re the star of the party. After the bride, of course. The sangeet is one of the most versatile functions at an Indian wedding. It’s casual yet traditional, and you can really play around with your outfit here. At Study By Janak, you’ll get a wide variety of styles from which to choose. From traditional silhouettes to more unconventional designs, you can find anything to suit your style here. The day of the wedding calls for elegance and subtlety at its finest. On the day when your friends are finally going to be husband and wife, they should stand out the most. But that doesn’t mean your style statement has to take a backseat. This is the moment for your ethnic fashion sense to shine. Explore the wedding collection in Study By Janak to find some of the most exquisite pieces for your friend’s wedding day. Here are some examples of the gorgeous pieces in their collection. The last function of an Indian wedding calls for a hint of royal glamour. While the bride and groom are busy meeting relatives and formal acquaintances, you can concentrate on your regal style. The sarees, gowns, and formal suits by Study By Janak are perfect for such an occasion. Here is our pick for receptions from their collection. But you can head to the nearest Study By Janak store and choose your wedding outfit with ease. Now that your outfits for your friend’s wedding is sorted, you can get back to dance practices and planning the several parties leading up to the wedding.